This will be a tutorial for setting up your own LAMP stack on Debian 7 Wheezy but this might also work for Ubuntu but is not guaranted. 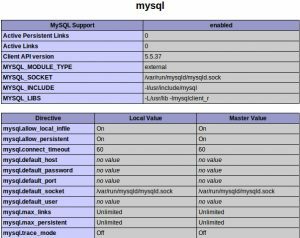 LAMP is an acronym for a software bundle that is Linux, Apache, MySQL & PHP. There are already available installer for this software stack like XAMPP which can be easily installed but if you want to setup your own LAMP stack using Debian aptitude then please read on. Ill assume you have already installed Debian 7 Wheezy and is already ready for setting up your LAMP stack. Login as root in your terminal by typing su or you can use sudo if you have installed it earlier. To make sure that your system is up to date just type in the command below in your terminal. it should ask you a root password like the image below. 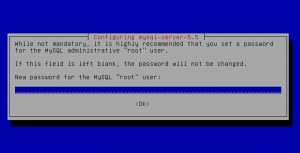 This root password is different from your Debian root password and this will only be used for MySQL access. You can either leave it blank for now but make sure to add a password later specially if you are going to allow remote connection. 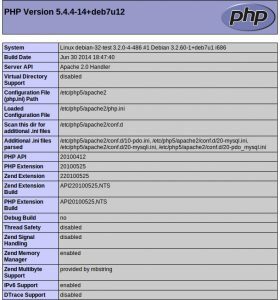 To check if everything works properly we will make Apache serve a php file with echo ofphpinfo(). where /var/www is the location of the DocumentRoot. Thats it, now you have a working setup of a LAMP stack.